Beispielhaft an einem Spritzguss Prozess. Vielen Dank für 10.000+ Downloads ! I’m pleased to inform you that our paper „Effective Run-In and Optimization of an Injection Molding Process“ has achieved impressive readership results. 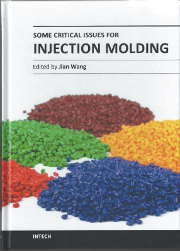 The chapter we have published with InTech in the book „Some Critical Issues for Injection Molding“ has so far been accessed 3000 times. Congratulations on the significant impact that your work has achieved to date.